Wheelie Bins are a great invention, but with some local councils considering extending the time between collections to 3 weeks, looking after them has never been more important. As well as doing what they were designed for, wheelie bins are often also used for anti social purposes, so it’s up to you to make sure you don’t become a victim of misuse of your bin! Whether first hand, or on the BBC TV News, we’ve all seen the consequences of wheelie bins that have been used in arson attacks on schools, homes or businesses. When used for arson attacks, typically the wheelie bins are stuffed with combustible materials to form a fire bomb, then positioned against a doorway or other vulnerable point of the building and set alight! The resulting damage can run into tens of thousands (or even hundreds of thousands) of pounds, but storing your bins securely will stop your wheelie bin being misused! BBC’s popular ‘Beat The Burglar’ TV series, offers practical advice on how to protect your home against burglars. In a recent episode, Dom, the presenter of the show, demonstrated how a wheelie bin makes an excellent vehicle for carrying away the items stolen from your property …having filled the bin with the items stolen from the house, he simply wheeled it away down the street! Storing your bins securely will ensure your bin won’t be used as a getaway cart for the burglar! You may lock up your ladders, but what many people overlook is that the wheelie bin can be used by thieves or vandals, as a climbing frame to gain access to your flat roofs or other vulnerable areas! Locking up your wheelie bin in a safe area will ensure that yours can’t be used in that way …the Wheelie Bin Store offers a practical low cost solution! We all know that kids have nothing to do these days! …so it’s hardly surprising that cases of mindless morons emptying the contents of wheelie onto the street or into gardens, just for fun, etc. are not uncommon. Not only is the result an unpleasant mess, but it could also pose a health risk, or encourage unwelcome animal attention from the likes of rats, foxes or seagulls. Securing your bin inside a secure storage solution is a quick, easy and convenient solution! A long time favourite with Local Authorities, Housing Associations, Schools and many other organisations, the popular wheelie bin lock is now also widely used by homeowners, fed up with their wheelie bins being used and abused by idiots during periods of anti-social behaviour. 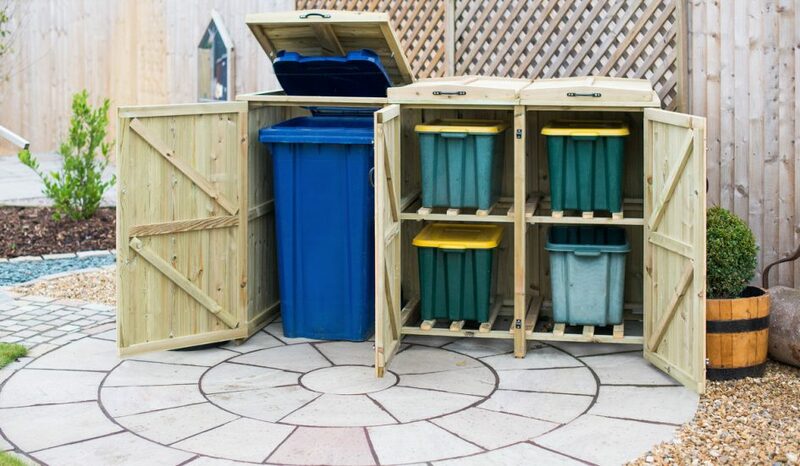 If you are looking for wheelie bin stores, check out My Garden Storage for some attractive ideas.